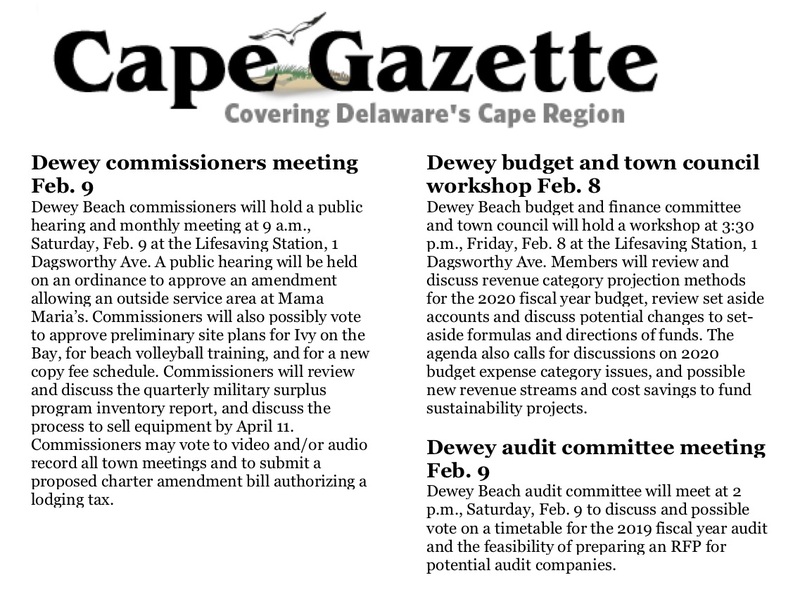 This will be a busy weekend in Dewey for the town government on issues which residents may find important. 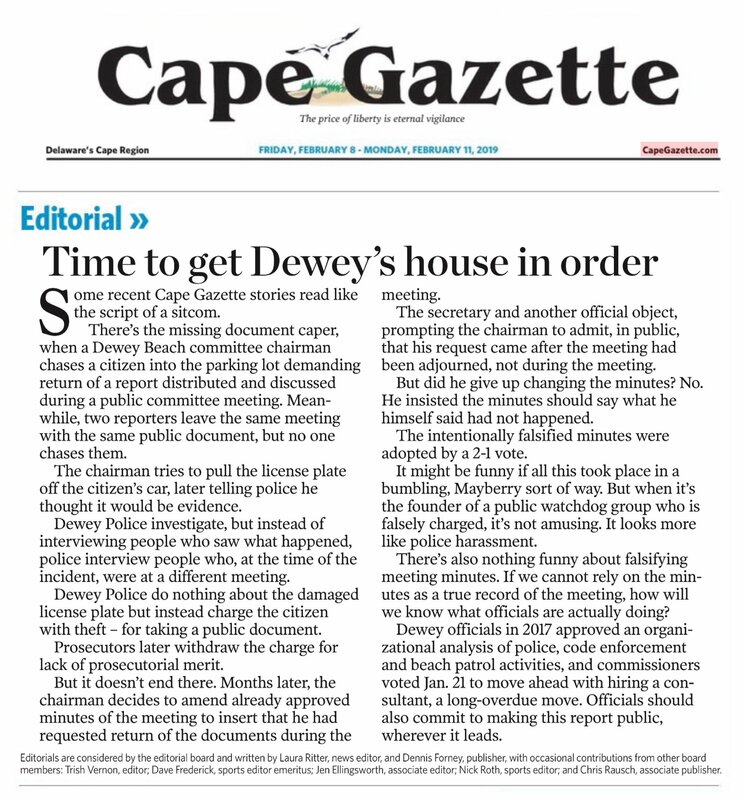 Dewey Beach has been in the news even in February, as the Cape Gazette outlines in today’s editorial below. At Saturday’s town Council meeting (9am) there will be more reporters in attendance than usual. Even if you can’t attend in person, you may want to watch the council meeting broadcast on the town’s website:www.townofdeweybeach.com. The issue attracting the media to the Council Meeting, ironically, is the Mayor’s opposition to live-streaming and video taping the town’s Committee meetings, including the one today at 3:30pm. Only Town Council is currently video streamed/recorded. But there are ongoing Audio issues with the sound equipment. As a result of letters of complaint, the Mayor and Town Manager have been well aware of the sound failures for three months now, but have delayed the small but important hardware changes to the audio system to allow viewers to properly hear the discussions. Today’s (Friday) 3:30pm joint workshop with the Town Council and the Budget Committee, deals with new tax proposals, and the resistance to do responsible budget set asides (rainy day reserves). Yet it will not be videotaped or broadcast by the town in spite of it being a town council event and important. For example, there are large unexpected expenses such as over $63,000 paid to contractor TGM, LLC separate from the audit, just for the reports on the town’s military surplus program which excluded 99% of the equipment and which provided no new information on key issues of where money and equipment went. The cost estimate TGM provided of $24-27,000 was exceeded by a factor of two. But worse, to this day we still don’t know where the equipment went or what the reasons were for bartering of over $300,000 to private parties without proper invoices listing services. The Budget Committee will feature a budget expert independent of the Mayor and Town Manager who has worked to promote Accountability. The budget expert believes spending can be cut in contrast to rosy scenarios and tax increases suggested by Mayor Redefer. Her presentation will not be broadcast or videotaped by the town. Then Saturday afternoon at 2:00pm the new audit committee will meet. This is the first meeting since former chairman Larry Silver was removed due to the issues of the Minutes discussed in today’s Cape Gazette editorial. For the first time in five years of rule by Silver and TGM, a new Chairwoman was appointed with new members. This offers a strong hope for Accountability. DCA will have a videographer to record and post all three meetings at no cost to the town within a day or two. The Mayor has only agreed to record the audio for committee meetings, but a multiple-hour audio tape is not practical to know who is speaking and who is voting (since voting is often done by an indication of members’ raised hands). How can Dewey Residents help? 1) Email the Mayor and council (link) ,with copies to DCA), asking to livestream and video record all Committee and Council meetings, with proper audio hardware; 2) urge fiscal responsibility and accountability to have Dewey set asides for the future and to rein in out of control spending on contractors such as TGM including soliciting bids for services as required by the town Charter; and 3) continue to be engaged so that Mayor Redefer and all members of the Town Council hear the residents desire to be accountable and clean up Dewey this spring. As the editorial said today, it’s time, and there are responsible members of the Council that need citizens push to operate in the sunshine of open, broadcasted meetings.